Just when you think the adventure is over, there is another adventure. I was elated that I found another Ruth Reichl book when I finished the first one and this second one was an even better read. As it seems the way with first and second books, the first one was decidedly more happy than the second, but it wasn't necessarily bad news. Ruth takes us on more adventures abroad and at home; she eats, she loves, and she makes me fall in love in with her for all these new reasons. 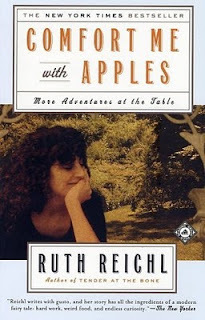 I feel like I have discovered a piece of myself when I read Ruth's books, and I love that about her. I feel her language, if that makes sense. Comfort Me With Apples is a great book, and if you liked Tender at the Bone, you will love this follow up because it literally picks up right where Tender at the Bone left off; I love her for that. So often, I put a book down and I am wondering where in the heck it went from there, and I love when writers connect the dots. Ruth connects the dots and fills in the picture of a life. I am sure I am not in a unique position of relating to this woman; she has layers that surely anyone could relate to. But there is something special that ties us together, and of this, I am certain. Ruth lived for a long time on a commune. Now, I did not live on a commune, but I have lived with some many people communally at our farmhouse that I sort of feel like I lived on a commune--for better or worse. And then, the people sort of drifted away and there we were: the two of us, my husband and I... left alone in a place that was once the home to so many people. And that is a strange thing. I suppose I don't quite have the words to explain what it was like to cook for 8 or 10 people and then, in the blink of an eye, there was just two of us. But I know that Ruth can relate to me on this point, though she was the one doing the walking away rather than the staying. When I read it as she tells it, though, I see something of myself, and I am comforted by that. Her food adventures also mature with her own life, which I think is remarkable considering how many people fail to grow in life. I love the relationship with her parents, too. If you read the first book, you were likely as fascinated by her parents as you were by her, and I think she expands on the relationship in the way that only an adult child can do. Well, now I am going to log back onto my Kindle and download her next book because I am hooked... I am addicted to Ruth Reichl and I don't care who knows it. When it comes to food writing, she is IT. I know it might seem like I am pushing her books, but it's only because the writing is so exceptional, and the story so compelling. Just do it. You won't be disappointed.